Wavans is a village 14 kilometres north-west of Doullens and 32 kilometres north-east of Abbeville. The Cemetery is north-west of the village on the road running north from the Auxi-le-Chateau road (D938) to the Bois d'Auxi. Wavans British Cemetery was made by the 21st Casualty Clearing Station in May-September 1918. The cemetery contains 43 Commonwealth burials of the First World War and one German war grave. Among those buried in the cemetery is the flying ace Major J T B McCudden, VC, DSO and Bar, MC and Bar, MM, who died of wounds in July 1918. 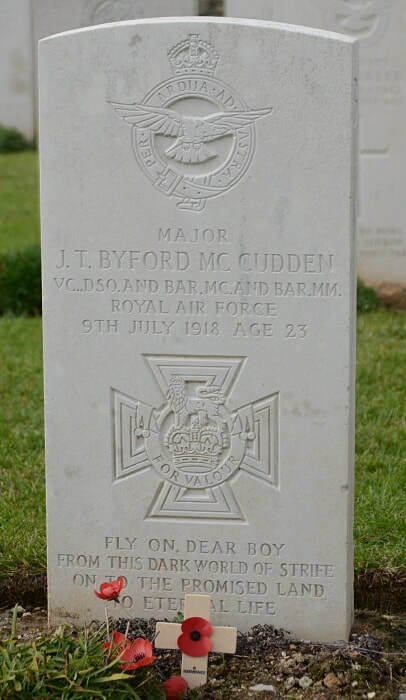 Major James Thomas Byford McCudden V. C., D. S. O., and Bar, M. C. and Bar, M. M.
​60th Squadron Royal Air Force, died of wounds on 9th July 1918, aged 23. Row B. 10. Croix de Guerre (France). Son of Amelia E. McCudden, of "Pitlochry," 37, Burton Rd., Kingston-on-Thames, and the late William McCudden. His brothers William T. J. McCudden and John Anthony McCudden also fell. Citation: An extract from "The London Gazette" No. 30604, dated 29th March, 1918, records the following:- "For most conspicuous bravery, exceptional perseverance, keenness and very high devotion to duty. Captain McCudden has at the present time accounted for 54 enemy aeroplanes. Of these 42 have been definitely destroyed, 19 of them on our side of the lines. Only 12 out of the 54 have been driven out of control. On two occasions he has totally destroyed four two-seater enemy aeroplanes on the same day, and on the last occasion all four machines were destroyed in the space of 1 hour and 30 minutes. While in his present squadron he has participated in 78 offensive patrols, and in nearly every case has been the leader. On at least 30 other occasions, whilst with the same squadron, he has crossed the lines alone, either in pursuit or in quest of enemy aeroplanes. 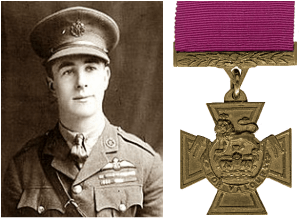 The following incidents are examples of the work he has done recently:- On the 23rd December, 1917, when leading his patrol, eight enemy aeroplanes were attacked between 2.30 p.m.. and 3.50 p.m. Of these two were shot down by Captain McCudden in our lines. On the morning of the same day he left the ground at 10.50 and encountered four enemy aeroplanes; of these he shot two down. On the 30th January, 1918, he, single-handed, attacked five enemy scouts, as a result of which two were destroyed. On this occasion he only returned home when the enemy scouts had been driven far east: his Lewis gun ammunition was all finished and the belt of his Vickers gun had broken. As a patrol leader he has at all times shown the utmost gallantry and skill, not only in the manner in which he has attacked and destroyed the enemy, but in the way he has during several aerial flights protected the newer members of his flight, thus keeping down their casualties to a minimum. This officer is considered, by the record which he has made, by his fearlessness, and by the great service which he has rendered to his country, deserving of the very highest honour." ​Robert Alexander Little, D.S.O., and Bar, D.S.C. and Bar. The centre picture shows a wooden cross marking the grave of Captain Robert Alexander Little DSO and bar, DSC and bar, French Croix de Guerre and Star, who was killed in action near Noeux, France on 27 May 1918. The vertical cross post is 35 inches in length while the horizontal cross member is 24 inches long. The wood used to make the cross is rectangular and is approximately 23/8 by 33/8 inches. A carved wooden circle has been built around the cross so that each 'quadrant' locks into two arms. The words 'No 3 Naval Squadron' have been engraved into the upper half of this circle with 'May 27th 1918 aged 23 Yrs' appearing on the obverse side of the lower hemisphere. 'FLGT COMDR R A LITTLE, RN KILLED IN AERIAL COMBAT ' has also been carved into the horizontal cross member while the words 'IN MEMORY OF' together with the decorations 'DSO DSC' are carved into the vertical cross post. Screwed into the center of the cross is a miniature British helmet, made of metal, with the embossed Greek symbol for Christ. A metal Rising Sun badge has been mounted on the main post below the British Helmet. The Graves Registration Unit have nailed five small metal plates on the reverse side of this post. 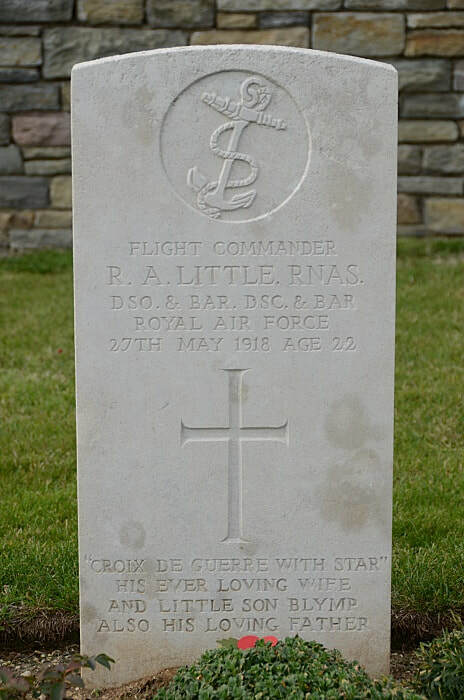 These are marked with the following details: G R U, CAPT R A LITTLE, 27th May 1918, 1-D-7,7.